President Donald Trump, First Lady Melania Trump and several senior congressional members congratulated H.H. Dorje Chang Buddha III for His birthday in honor of His status as the supreme leader of all Buddhism and selfless contributions. LOS ANGELES, CA, August 04, 2018 /24-7PressRelease/ — On June 24, 2018, the flag of the United States was raised over Holy Heavenly Lake in California. That flag was not bought from the street. Rather, it was the very flag that on May 15th was fluttering in the sky above the United States Congress in Washington, D.C.. The same flag was later delivered to the Office of H.H. Dorje Chang Buddha III. The raising of that national flag at the Capitol was inspired by the Buddha-character of H.H. Dorje Chang Buddha III. May 15th is the birthday of H.H. Dorje Chang Buddha III. That national flag was raised at Capitol Hill in Washington, D.C. specifically for the birthday of H.H. Dorje Chang Buddha III. The flag-raising document stated, “This flag was flown in honor of H.H. Dorje Chang Buddha III, supreme leader of all Buddhism, on the occasion of his birthday." In their message congratulating H.H. Dorje Chang Buddha IIIon His birthday, United States President Donald Trump and First Lady Melania Trump stated, “His Holiness Dorje Chang Buddha III, Pasadena, California. Your Holiness, we are pleased to join your family and friends in wishing you a happy birthday! As you celebrate this special occasion, we pray your year ahead is filled with good health, happiness, and the many blessings of our great Nation. With very best wishes." A number of senior congressional members from both the House and the Senate also sent letters to congratulate H.H. Dorje Chang Buddha III on His birthday, including House Speaker Paul Ryan, Chairman of the House Foreign Affairs Committee Ed Royce, former Chairperson of the Senate Intelligence Committee Dianne Feinstein, the Ranking member of the Senate Committee on Appropriations Patrick Leahy, and others. Additionally, the United States Postal Service authorized the issuance of a first-day cover to commemorate this significant day of raising the national flag in Washington, D.C. to celebrate the birthday of H.H. Dorje Chang Buddha III. On June 24, 2018 when that flag of the United States was flying above Holy Heavenly Lake in California, several thousand Buddhist figures from all over the world voluntarily congregated at Holy Heavenly Lake. Most of them are dharma masters and religious teachers within Buddhism. The “Celebrating the Birthday of H.H. Dorje Chang Buddha III" Grand Dharma Assembly was held there. Buddhists knelt on the ground with khatas in their hands, waiting for the holy presence of H.H. Dorje Chang Buddha III. At around 5:00 in the afternoon, H.H. Dorje Chang Buddha III arrived. Guarded and protected by multiple-layers of police officers and S.W.A.T. crews, His Holiness the Buddha walked onto the red carpet. All Buddhists kept chanting loudly, “Namo H.H.Dorje Chang Buddha III!" Venerable Mozhi, the person in charge of World Buddhism Association Headquarters in the United States, announced at the dharma assembly that a Buddhist city will be built at Holy Heavenly Lake in California. This Buddhist city will be similar to the Vatican, where the Pope of Catholicism resides. The “True Dharma Temple," where H.H. Dorje Chang Buddha III will reside, will also be built there. Holy Heavenly Lake is a Buddhist treasure-land. Beneath it is a huge underground crystal lake. Below the lakeside of Holy Heavenly Lake, there is also an underground river which is one of the two great underground rivers in the world that flows from south to north. That place is truly auspicious! The Buddhist city will accommodate temple clusters, businesses, tourism, hotels, rivers and ferry boats, all threaded together into an aquatic city by nautical waterways. Most important of all, the Ancient Buddha True Dharma Temple—the holy site for spreading true Buddha-dharma—will become the most authentic holy site in the world for propagating true Buddha-dharma! Who is H.H. Dorje Chang Buddha III? Why is His Holiness given such importance by our nation and respected so broadly by the public? In December of 2002, H.H. Dorje Chang Buddha III was awarded the Gold Medal issued by President George W. Bush to honor His Holiness’ noble ethics and morality, accomplishments in artistry, and outstanding contributions to humanity. In 2010, H.H. Dorje Chang Buddha III was awarded the World Peace Prize – Top Honor Prize. In 2011, H.H. Dorje Chang Buddha III was awarded the distinguished Dr. Martin Luther King Jr. Legacy Award for International Service and Leadership. In 2018, the status of H.H. Dorje Chang Buddha III as the supreme leader of the entirety of Buddhism was once again confirmed! As early as in 2012, the United States Senate passed Resolution No. 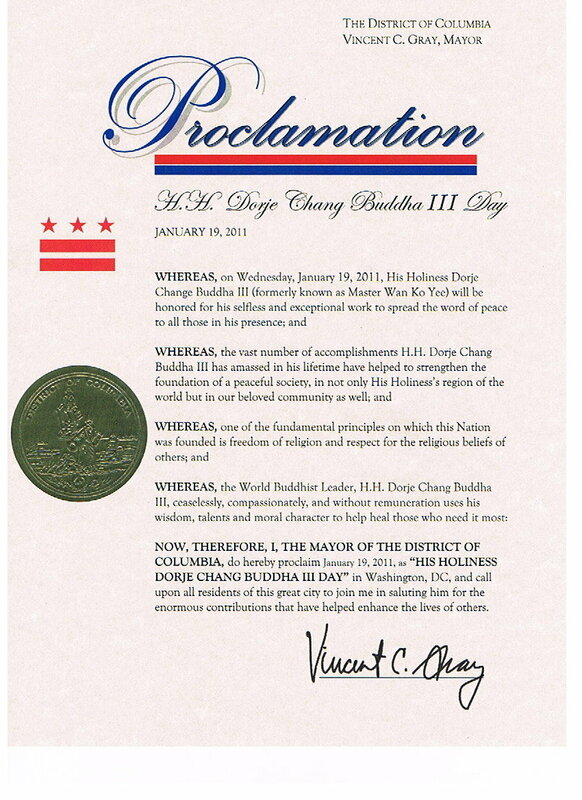 614, formally designating H.H.Dorje Chang Buddha III with the honorific title “His Holiness" (abbreviated as H.H.). Such a title indicated recognition of the highest level, unexcelled and most treasured status. This resolution officially placed the status of H.H. Dorje Chang Buddha III at the highest level. I had the good fortune to ask H.H. Dorje Chang Buddha III, “I heard that Your Holiness has the status of the Pope of Buddhism and that Your Holiness has received the Buddhist Papal Scepter." H.H. Dorje Chang Buddha III said, “Is there any meaning in that? The true Buddhist scepter is to be enlightened and then enlighten others." The status of H.H. Dorje Chang Buddha III was conclusively established according to the system of Buddhist recognition in a manner similar to how the Penchen Lama, Karmapa, and others were recognized. Such status is not self-conferred but determined by the system. According to the Buddhist system of recognition, it only takes two rinpoches or lamas to issue a recognition. The recognition is then considered formally established. In the entire history of formal recognitions within Buddhism, H.H. Dorje Chang Buddha III is the one who has received the largest number of recognitions. No one has ever gotten even one-fifth of the recognitions that H.H. Dorje Chang Buddha III has received. This establishment of the position of H.H. Dorje Chang Buddha III based on conclusive evidence cannot be affected in any way by anybody’s endorsement or veto. Rather, it is a systemic and ironclad conclusion. It has been twenty years since H.H. Dorje Chang Buddha III came to the United States from China. Since it is His vow of conduct not to accept any offerings, His Holiness makes his living mainly from income generated from His paintings and sculptures. His Holiness lives a very simple life yet vigorously supports matters of justice, deeds of benevolence, charity to the needy, and the benefiting of others. His Holiness even sold paintings specifically to cover the expenses of temples and the livelihoods of monastics. In the early years when H.H. Dorje Chang Buddha III was in Chengdu, China, living supplies were scarce and people lived on rations. Whenever His Holiness was home, patients with all kinds of illnesses came in an endless stream to seek treatment. Three hundred people registered to seek treatment from Him each day. His Holiness the Buddha always treated patients with no conditions attached and without accepting even one cent. When encountering poor patients who could not afford their medicine, H.H. Dorje Chang Buddha III even gave His own limited rationed living supplies to those poor and sick patients. Even when His Holiness had nothing to eat and was about to faint, He still refused to accept the food offered by His patients. In His teenage years, H.H. Dorje Chang Buddha III used the iambic format of “Nian Nu Jiao" to compose the verse “Immediate Entry into the Universe," in which He wrote, “Three thousand patients come to my door. Day and night, I apply herbal medicine to do wonders." That was a depiction of the situation then. Recently, in the Grand Hall of the Buddha at the Holy Miracles Temple in the United States, Ms. Judy Kuan, who is the younger sister of an important high-level political figure in Taiwan, revealed a deeply hidden secret that people did not know for many years about H.H. Dorje Chang Buddha III. Her reading of the factual account was hosted by dharma masters. Following the beating of the drum and the striking of the bell, in front of the statue of Sakyamuni Buddha and the congregation, she made a grave vow to tell the truth. Such truth astounded everyone in the audience. She mentioned that the elderly Mr. Pan Shiao Rui, the ship-dismantling king who was a disciple of H.H. Dorje Chang Buddha III, wanted to present offerings to H.H. the Buddha many times. Ms. Kuan was always the contact person for him. Mr. Pan Shiao Rui told her that he and Dharma Master Hsing Yun went to Taiwan together in the early years. At that time, Mr. Pan sponsored all the expenses of Dharma Master Hsing Yun as well as the living expenses of his monastic followers. He was also the sponsor and supervisor of the International Buddha’s Light Association. The affiliated Hsi Lai Temple in the United States was also built mainly from his donations. In 1999, shortly after H.H. Dorje Chang Buddha III came to the United States, Mr. Pan invited H.H. Dorje Chang Buddha III to San Francisco to look at a piece of land that he wanted to present as an offering. Real estate in San Francisco was priced like gold! Mr. Pan first invited H.H. Dorje Chang Buddha III to look at a piece of land in the suburbs of San Francisco that was more than 2,000 acres. H.H. Dorje Chang Buddha III declined his offering, using the pretext that the land was too big. Mr. Pan then found another thirty-seven-acre (approximately 201 Chinese mu) piece of land in the city of San Francisco. H.H. Dorje Chang Buddha III again declined, using a different reason. Then Mr. Pan found and offered a seven-story Spanish-style building of 65,000 square feet in Oakland, which was again declined by H.H. Dorje Chang Buddha III. Having no way to make his offerings, Mr. Pan resorted to presenting monetary offerings each year in huge sums of over US$1,000,000. H.H. Dorje Chang Buddha III did not accept even one of them. His Holiness always told Judy Kuan to give Mr. Pan the bank account number of either a Buddhist organization or a temple. However, what you cannot imagine is that H.H. Dorje Chang Buddha III was not even a member of those temples or organizations. In 2013, the elderly Mr. Pan came for the last time to America to pay respect to H.H. Dorje Chang Buddha III. He said that he had reached an advanced age and was preparing to leave this world. He had come that time to present a large amount of gold as an offering. Mr. Pan was once the deputy chief of staff to Dai Li, who was a senior official in the Kuomintang (Nationalist Party). Mr. Pan was responsible for managing some business and financial affairs for Dai Li. At that time, Mr. Pan bought a large amount of gold, which was put away in a Hong Kong treasury. The gold bars weighed two kilograms to five kilograms apiece, and there was a huge quantity. He wanted to present all the gold to H.H. Dorje Chang Buddha III as an offering. He even discussed with Judy Kuan whether to transport the gold by plane or ship. You can imagine the vast quantity! H.H. Dorje Chang Buddha III immediately refused the entire offering and did not even allow him to mention the word “gold" again. To stop the elderly Mr. Pan, H.H. Dorje Chang Buddha III told him not to mention making an offering again; otherwise, his karmic connection with the dharma would be damaged. Other people would use all possible methods to arouse their followers to make offerings, yet H.H.Dorje Chang Buddha III rejected such enormous offerings! Is this something an ordinary person could do? Who can have such selfless, greedless character of holy purity! Think about this: If one were given free of charge such an enormous amount of land, buildings, cash, or gold, if one were given such glittering money and wealth with no strings attached, who could remain unmoved? H.H. Dorje Chang Buddha III was not only unmoved, He graciously declined all of those offerings! H.H. Dorje Chang Buddha III came to the United States in 1999. Actually, His life in the United States has always been very arduous, but He has never minded that. All that His Holiness thinks about are the interests of the public. His Holiness serves as a model for others, teaching cultivators with His own words and conduct. For the past twenty years until now, His Holiness has always lived a hard and simple life. I often go to the home office of H.H. Dorje Chang Buddha III. Mentioning that office may elicit laughter. It is in a corridor right outside a bathroom. With all kinds of books and other things piled up there, the remaining space is at most only four square meters. When someone is coming through the corridor, those sitting there have to get up to let that person through. You cannot even imagine that in the twenty years during which H.H. Dorje Chang Buddha III has lived in the United States, His Holiness has not even had a dining table. He always eats His meals at the kitchen counter. Many Buddhist eminent monastics and greatly virtuous ones have eaten meals with H.H. Dorje Chang Buddha III. They, too, stood beside the kitchen counter just like H.H. Dorje Chang Buddha III did. Almost all of the space inside the home of H.H. Dorje Chang Buddha III is taken up by the storage of Buddhist objects and His Holiness’ accomplishments in the Five Vidyas. I once personally saw H.H. Dorje Chang Buddha III sewing and mending His own clothes. His Holiness said with a smile, “Too bad, I accidentally slit it!" How could an ordinary person fathom the holy purity and greatness of H.H. Dorje Chang Buddha III? When one is rich, perhaps one can be indifferent toward donations from others. However, what about when one is poor, in need of money, and is presented with a huge sum of money with no strings attached? Only H.H. Dorje Chang Buddha III can remain unmoved in such circumstances! In this society, everybody wants to become rich. They dream of becoming rich. When someone else is perfectly willing to give away a huge amount of money and assets with no strings attached, this is everyone’s get-rich dream coming true. H.H. Dorje Chang Buddha III did not even take a look at those offerings and simply refused them with ease. Where else in the world is there a person who does not enjoy what he is able to enjoy, who gives up wealth, and who keeps hardships for himself? Who can attain such virtuous conduct? Perhaps only Sakyamuni Buddha and H.H. Dorje Chang Buddha III can do so. Before the true identity of H.H. Dorje Chang Buddha III was known to the world, His Holiness the Buddha was already world-famous for having attained the pinnacle of accomplishment in the Five Vidyas. Just in painting alone, His Holiness single-handedly founded sixteen painting styles used in both Chinese and Western painting. The subject matter of those paintings include people, birds, insects, fishes, nature, still life, mountains, water, and landscape. The brushwork includes realistic fine brushstrokes and freehand brushstrokes, and the techniques include abstract, realist, and impressionist techniques. Each work of art is an accomplishment that is unparalleled. His Holiness’ paintings, calligraphy, and sculptures are collected by the International Art Museum of America. The H.H. Dorje Chang Buddha III Cultural and Art Museum is dedicated to permanently exhibiting artworks created by His Holiness. This year, senior officials from the White House were guests at the home of His Holiness. One of them asked His Holiness, “Seeing your artistic accomplishments, there is a puzzle that none of us can figure out. Do you spend twenty-four hours every day to create art? Even if you spent twenty-four hours a day, you still could not possibly have created so many artworks!" H.H. Dorje Chang Buddha III replied, “I am very ashamed. I am immersed in Buddhist matters every day. I spend so very little time creating art." That senior official from the White House then asked, “We have seen your artworks. There is one piece that you could not have possibly finished even if you worked on it every day for several decades. That is what we are unable to understand. How did it come into being?" The person in charge of the Office of H.H. Dorje Chang Buddha III replied, “The piece you saw is only one percent of the artworks created by His Holiness the Buddha." Upon hearing that, everyone was even more astounded and puzzled. This truly is a fact that cannot be explained through ordinary human thinking. In fact, be it the zither, chess, calligraphy, painting, sculpture, landscape design, literature, poetry, iambic verses, odes, songs, maxims of philosophy, singing, and other disciplines, H.H. 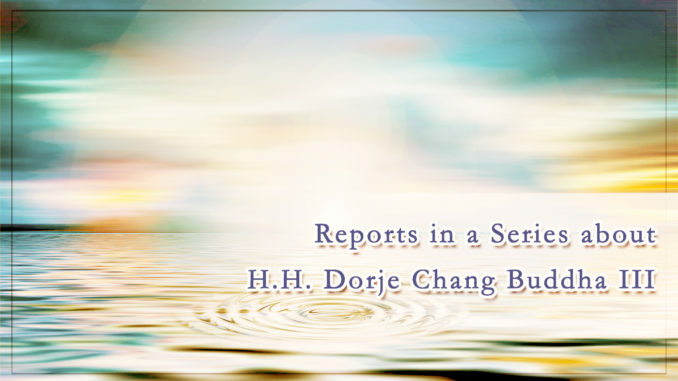 Dorje Chang Buddha III has distinguished expertise in all of them. H.H. Dorje Chang Buddha III can indiscriminately take into his hands any musical instrument and play it. His Holiness is exceptionally accomplished even in scientific research and culinary skills. The physical strength of H.H. Dorje Chang Buddha III is also quite extraordinary. This year, His Holiness effortlessly picked up with one hand an Earth Vajra weighing 220 pounds and put it on the offering table. More than 2,000 people have tried to pick up the same Earth Vajra, including a gym-trainer of extraordinary strength who is in his twenties and weighs over 200 pounds. However, until now, nobody has been able to lift that Earth Vajra off the ground with one hand. It has been twenty years since H.H. Dorje Chang Buddha IIIcame to America. Throughout all these years, His Holiness has been voluntarily serving the public. Although there are designated people who prepare the meals for His Holiness from another work area, whenever the cooks ask H.H. Dorje Chang Buddha III what He would like to eat, He always relies, “I eat whatever you prepare. Something simple and in a small amount is fine." For twenty years, H.H. Dorje Chang Buddha III has never specified the food that He wanted to eat. Those people are cooks in His Holiness’ own kitchen, yet His Holiness has never had any craving for the joy of food throughout these decades! The innate character of H.H. Dorje Chang Buddha III cannot be fathomed by common people. H.H. Dorje Chang Buddha III never reveals His true state of Buddhahood to the world. When evil masters slandered His Holiness by saying He is not a Buddha, He did not mind in the least and never manifested His holy realization to prove that He is a Buddha. Last year, some people of evil spirit brought on demonic forces to damage the wisdom-lifeblood of numerous Buddhist disciples. When someone openly raised questions about that, H.H. Dorje Chang Buddha III reluctantly manifested the true appearance of Buddha in order to save living beings. White thin hairs instantly emerged between His Holiness’ eyebrows. At the time, some people saw one white hair, while others saw a large tuft of white hairs. Some saw white spiraling hairs intertwined like pearls. Some saw the hairs radiating and standing like steel needles, emitting white light. During the same time, what each person saw was different. A Caucasian who was a high government official said that he did not see the white hairs but did see two completely different visages of H.H. Dorje Chang Buddha IIIwithin one minute! When H.H. Dorje Chang Buddha IIImanifested His sambhogakaya appearance as a Buddha, His entire face became the bright and beautiful color of red coral. Moreover, the two sides of His face emitted strong light, like that of the sun, causing some people to be unable to open their eyes. His Holiness also manifested the even-teeth appearance, which is one of the thirty-two marks of a Buddha! H.H. Dorje Chang Buddha III truly is an ancient-Buddha Tathagata. No wonder His Holiness has reached the unmatched pinnacle of accomplishment in the Five Vidyas. No wonder His Holiness is perfectly proficient in the sutras and treatises, can do that which is difficult to do, and can endure that which is difficult to endure. No wonder His Holiness has no greed, has no anger, and has not even the slightest mental attachment. His great wisdom is limitless, and His compassion is boundless. All of these qualities are due to the innate character of a Buddha. Since being recognized as H.H. Dorje Chang Buddha III by the leaders of each of the major Buddhist sects and schools, His Holiness has been even more fully occupied with dharma matters. His Holiness no longer creates any paintings. As always, His Holiness voluntarily serves the public, transmitting dharma and expounding dharma for an average of eight to twelve hours a day. His Holiness often grants audiences to disciples until 2:00 or 3:00 in the wee hours of the night. Even though His Holiness has arduously served others on a voluntary basis over such a long period of time, He nonetheless has never accepted any offerings. It seems that there has never been another person in this world who is so selfless, who always puts benefiting others above all else, and who always serves the interests of others without a care for himself. This is truly quite inconceivable! In this world, people of talent are not necessarily virtuous. Moreover, they are usually talented in one particular discipline. People of virtue may not necessarily be talented. Moreover, the virtue they possess is often ordinary. However, H.H. Dorje Chang Buddha III possess perfect and flawless virtue along with talent that has reached the apex of accomplishment. Furthermore, what the world respects and admires most is that H.H. Dorje Chang Buddha III saves living beings out of loving compassion. His Holiness has no anger or hatred at all, even toward those who harmed, deceived, or slandered Him. His Holiness even often prays for those people, wishing them happiness. For example, many years ago H.H. Dorje Chang Buddha III was falsely persecuted, which led to the launch of a special investigation by INTERPOL. That was three full years of tribulation. Yet, just as real gold fears no fire, a man of integrity can stand severe tests. The case against His Holiness was dismissed during the 72nd session of the Commission for the Control of Interpol’s Files. Official written notification was subsequently issued to all member countries of INTERPOL, informing them that they cannot detain H.H. Dorje Chang Buddha III. China also submitted a report stating that H.H. Dorje Chang Buddha III did not commit any crime, and China requested that INTERPOL withdrawal the case against Him. INTERPOL even specially issued a document to H.H. Dorje Chang Buddha III regarding the conclusion of the case. After His Holiness received that document dismissing His case and clearing Him of all the smearing targeted against Him, His Holiness did not agree to show it on the internet. When asked why not, H.H. Dorje Chang Buddha III said, “If my name is cleared, then the names of those who harmed me will not be cleared." His Holiness the Buddha does not bear any anger or hatred toward those who harmed Him. His Holiness would rather be misunderstood by the world than have those who slandered and harmed Him experience suffering or dreadful consequences. What selfless, compassionate, and magnificent Buddha-character this is! This is the way H.H. Dorje Chang Buddha III is, personally applying His Buddha-virtue to teach and transform people, inspiring others to be good people, to abstain from all evil, to do all deeds of goodness, to be cultivators, and to be people who benefit others. This is the supreme and unconditioned Buddha-virtue. Buddha-character comes from the state of Buddha-enlightenment that perfectly integrates Buddha-wisdom, Buddha-merit, and Buddha-virtue. The wisdom of H.H. Dorje Chang Buddha III, His world-astounding accomplishments in the Five Vidyas, and His numerous achievements that are at the highest level are openly witnessed by the world. The holy realization of H.H. Dorje Chang Buddha III can be seen when His Holiness manifests His sambhogakaya appearance, when His Holiness teaches the dharma of the Tathagata, successfully invokes the presence of Amitabha Buddha, causes holy holy nectar (amrita) to descend to earth, and saves countless living beings. The Buddha-virtue of H.H. Dorje Chang Buddha III entails great compassion and forbearance. It is free of greed, anger, and attachment. It is completely devoid of selfishness, and is totally dedicated to benefiting others. Such purity and nobility exceeds even the brightness and purity of the sun and moon! When we see such inner character of a Buddha in H.H. Dorje Chang Buddha III, what can we who are ordinary beings say? Presented with offerings of a huge amount of gold, land, and wealth, His Holiness was completely without greed and remained unaffected. Who can do that? Holding a document from INTERPOL that cleared Him of all the accusations fabricated against Him, His Holiness simply locked the document into a safe without making any use of it. Who can do that? Having made the lifetime vow of not accepting any offerings, His Holiness is continuously busy expounding dharma to people and serving the public from early morning till late at night, even up to 2:00 or 3:00 in the morning, without receiving even one cent in return. Who can do that? The truth is, probably only Sakyamuni Buddha, all Buddhas in the ten directions, and H.H. Dorje Chang Buddha III can do so! In particular, on December 12, 2012, the Senate Resolution No. 614 of the United States Congress officially used “His Holiness” in the name addressing Dorje Chang Buddha III (That is to say, “H.H. Dorje Chang Buddha III.”) Since then, the title and status of H.H. Dorje Chang Buddha III has been definitive by nature. And, as a matter of fact, “DorjeChang Buddha III” is a name used legally in governmental and official legislative documents. Therefore, the previously used respected name and titles such as “Wan Ko Yee,” Great Master, and Great Dharma King no longer exist. UNIQUE ART Collections International Co., Ltd., on May 28th auctioned off Master Wan Ko Yee’s painting titled “Majesty”, which an art collector purchased through a competitive bid of NT$59,000,000 (roughly US$1,960,000). Wan Ko Yee is a great artists whose paintings cannot be matched by anyone in this day and age. China exhibited eleven of his paintings in an international at exhibition in Philadelphia in 1978. In its desire to display more than two hundred of Wan Ko Yee’s paintings, the Mainland Chinese government built a huge art museum — the first of its kind in Chinese history. Master Wan Ko Yee is not only a famous artist, he is also a leader in the world of art. When he was 20 years old, he was the head of the Chinese Painting Research Division of the China Education, Science and Culture Organization. This is a high level organization within art circles in China and its leaders include people such as Chou Ying-Nan, Wu Zhang-Shu, Qian Jun-Tao, Xie Zhi-Liako, Liang Shu-Ming, Wan Lai-Ming and Cang Ke-Jia. In the entire history of Chinese painting, no other great painter was able to master the amount of artistic skills, the variety of different styles and the diversity of subject matter which Master Wan Ko Yee has mastered. He can paint landscapes, people and other objects, animals, ﬂowers, birds, ﬁsh and insects by using the meticulous brushwork style or by using the freehand brushwork style. Whichever style he uses, his paintings are always elegant, grand and full of life. Master Wan Ko Yee’s skills have reached the highest level in the world when it comes to ink and wash paintings. Thus, in 1991, the World Poets and Culture Congress conferred upon him the title of “Master of Oriental Art” along with a medal. ln 1994, this same Congress conferred upon him the title of the world’s only “Distinguished International Master” — the highest position possible and is on the same level of honor as a head of state. Master Wan Ko Yee. He is a singer. There are 14 tapes and CDs containing his songs. And he is a scientist. He has developed two green teas called “Ba Wang Chun” and “Bi Yu Chun”, the best quality teas in the world. Being slandered for fraud in the past, now the truth of this falsely created case has been brought to the public, providing more evidence on the fact that all H.H. Dorje Chang Buddha III does is to benefit living beings. H.H. Dorje Chang Buddha III never accepts any offerings. With His noble standard and bright character, He never engages in the slightest act of defending His innocence. However, those who intend to slander Him took that as an opportunity and continuously spread lies related to a forged case of fraud. From the very beginning to now, that false case of many years ago has always been used by those who have ulterior motives to create malicious effects to deceive the public. In late July 1999, H.H. Dorje Chang Buddha IIIwas invited to visit the United States and arrived with a valid passport and US visa. Shortly after, He immigrated to the United States. In 2002, to smear and persecute H.H. Dorje Chang Buddha III, the Shenzhen Public Security Bureau deliberately fabricated an absolutely nonexistent case of fraud and maliciously spread rumors through the media under their control to slander H.H. Dorje Chang Buddha IIIas a “criminal at large.” For more than 10 years, those persecutors used their power to spread and further exaggerate the lies through all forms of media including newspapers, websites, social media, and others, in order to mislead the public to regard H.H. Dorje Chang Buddha III as a villain and fraudster. Due to the continuous depiction by the media of accomplice and the media being misled, such misinformation travels around. During this long period of time, such incessant deformation and smearing created evil karmas and destroyed or postponed many living beings’ opportunities of attaining wisdom. Therefore, it is truly necessary to make the facts clear starting from the very beginning! The origin of this incident dates back to 1999 when students of H.H. Dorje Chang Buddha III established an association of merit called “Wisdom & Mercy V. D. A. Limited” in Hong Kong. H.H. Dorje Chang Buddha III was not a member of that organization and did not serve at any position in it. Mr. Lau Pak Hun who is a student of H.H. Dorje Chang Buddha III donated a property he owned at Kowloon Tong to the “Wisdom & Mercy V. D. A. Limited.” Then, the “Wisdom & Mercy V. D. A. Limited” used that place to establish the Master Wan Ko Yee Museum in Hong Kong. However, as the leader running the operation of the Master’s Museum, Wong Hiu Shui openly used that opportunity to defraud members of the museum for money. She also secretly and illegally mortgaged the property of the museum to a bank for her personal purposes. After the incidents had been reported by Mr. Lin Hui Jiu, a student in Hong Kong, H.H. Dorje Chang Buddha III went to Hong Kong on the same day. At the meeting held at the museum, H.H. Dorje Chang Buddha III told the students in Hong Kong to form a group of inspection and reporting and put up a box to collect submitted written reports, to report and expose the bad person(s) committing the fraud. At that time, Mr. Li Zai Tang who was the director of the No. 5 Radio Station in Hong Kong and Mr. Feng Wei Chang who was an audio-recording technician at the radio station did the audio recording at the site. Wong Hiu Shui realized that her crime of fraud would soon be exposed. So in the morning of the next day, she went to the hotel where H.H. Dorje Chang Buddha III was staying and requested H.H. Dorje Chang Buddha III to dissolve the group of inspection and reporting. H.H. Dorje Chang Buddha III firmly declined her request. Then, Wong Hiu Shui privately contacted Wu Wentou, who was a director of the “Wisdom & Mercy V. D. A. Limited.” Wu Wentou later told news media publicly that Wong Hiu Shui asked him to be on her side to deal with H.H. Dorje Chang Buddha III. In exchange, she would ask her godfather, Niu Ping who was the vice minister of the Ministry of National Security to issue a special pass for him, so he could do business in China without any obstacle. Since Niu Ping’s son was a shareholder of her company, if Mr. Wu did not take her side, he would have bad luck too. Mr. Wu refused her request. On the third day, using her leadership position at the Master’s Museum, Wong Hiu Shui applied deceptive methods to close the Master’s Museum in Hong Kong, causing the group of inspection and reporting to be dissolved automatically. Since then, Wong Hiu Shui started to spread rumors and smear H.H. Dorje Chang Buddha III as a bad person. At that time, a few news media in Hong Kong followed along and did negative reporting, but the fact is that no one ever saw any video recording mentioned in the smearing. It was simply because Wong Hiu Shui made up the lies to smear H.H. Dorje Chang Buddha III, in order to cover up the fact of her defrauding for money. Wong Hiu Shui’s godfather Niu Ping was originally the head of the public security department of Sichuan Province and was promoted to the position of vice minister of the Ministry of National Security of China in 1997. Zhou Yongkang was at the position of party secretary of Sichuan Province from 1999 to 2002. After Wong Hiu Shui’s evil act of fraud was exposed, Niu Ping used his power as vice minister of the Ministry of National Security and joined force with Zhou Yongkang. They applied their political resources to carry out the smearing and persecution. A series of persecuting actions against H.H. Dorje Chang Buddha III took place in an enormous magnitude from Shenzhen to Sichuan, from local government to the central government, from China to overseas, and from printed news media to the internet. On June 20, 2002, ordered by the then chief of the Public Security Department of Guangdong Province, Chen Shaoji (Later he served the positions of secretary of the Politics and Law Committee of Guangdong Province and the chairman of the Political Consultative Conference of Guangdong Province and was eventually tried and sentenced to death with stay for embezzlement and corruption in 2010. 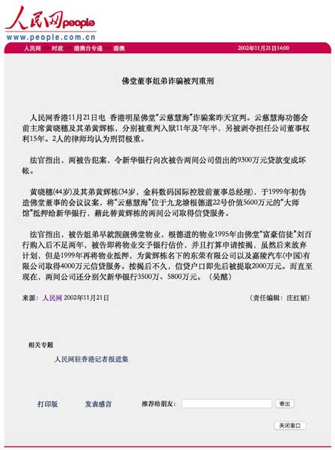 ), the Shenzhen Public Security Bureau used a baseless cause of “fraud through a contract” to issue a “Report Form to Place Criminal Case on File for Investigation and Prosecution” to create a case, alleging that H.H. Dorje Chang Buddha III signed a contract with Liu Juan in April 2000 to sell the already-sold Jixiang Property in Shenzhen to Liu Juan. It was alleged that only after wiring 150 million CNYs into the bank account designated by H.H. Dorje Chang Buddha III, did Liu Juan discover the fraud. The Shenzhen Public Security Bureau also planted a separate matter of Lau Pak Hun who is a businessman in Hong Kong being defrauded by Wong Hiu Shiu regarding a property on H.H. Dorje Chang Buddha III. However, a number of questions can be asked and need to be answered. Since coming to the USA in August 1999, H.H. Dorje Chang Buddha III never went back to China. 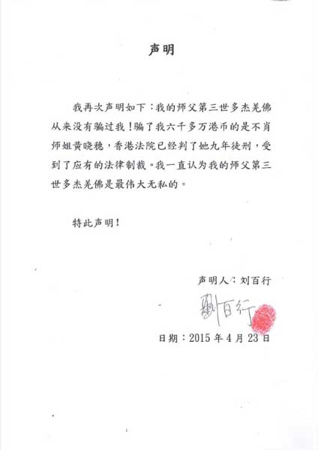 How could He possibly sign a contract with Liu Juan in Shenzhen in April 2000? H.H. Dorje Chang Buddha III never did any business in China and never had a company. Nor was He a shareholder or a member of the management or staff of any company. How could He sign any contract to sell the property? Furthermore, which bank was the account designated by H.H. Dorje Chang Buddha III in? And when and from which account did Liu Juan send the money into it? Why wasn’t such information released? The reason is that such accounts or money mentioned were simply nonexistent and were fabricated by the Public Security Bureau. In 2003, Liu Juan provided an affidavit notarized by the Consulate General of China to state that the public security personnel of Guangdong Province used needles and shackles to torture her to pressure her to made false witnesses. Liu Juan also testified that H.H. Dorje Chang Buddha III never defrauded her and only cared about and helped her. 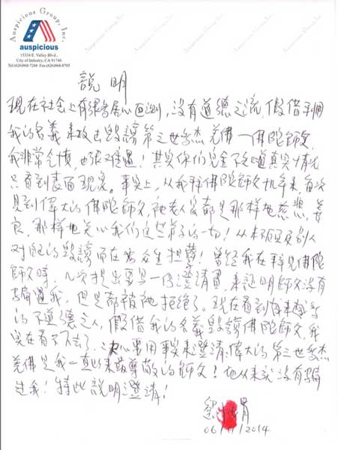 In 2014, Liu Juan again wrote a hand-written testimony and stamped it with her fingerprint. Lau Pak Hun also issued a fingerprint-stamped written testimony in 2015 to state that the person who defrauded him was his inferior fellow Buddhist sister Wong Hiu Shui and that H.H. Dorje Chang Buddha III never defrauded him. In November 2002, ICAC of Hong Kong prosecuted Wong Hiu Shui and her brother Wong Fai Tung for their crime of loan fraud by mortgaging the property of Master Wan Ko Yee’s Museum in Hong Kong to the bank. The judge announced at the court that the sister and brother defendants had long premeditated committing the fraud against the property of the Buddha hall and that this case had nothing to do with H.H. Dorje Chang Buddha III. For the crime of fraud, Wong Hiu Shui and her brother Wong Fai Tung were later sentenced by the Hong Kong High Court to 11 years in jail and 7.5 years in jail respectively. The news agency People’s Net (www.people.com.cn) in China immediately published a news report announcing that Wong Hiu Shui and her brother Wong Fai Tung received severe sentences for their crime of fraud. [iii]However, the Public Security Department of Guangdong Province was pressured by the instruction from Niu Ping, the then vice minister of the Ministry of National Security, to ignore the fact of Wong Hiu Shui’s sentencing and still issued an arrest warrant against the simply nonexistent “Wan Ko Yee’s group of fraudsters.” The arrest warrant was also published on the website of Xin Hua News Agency of Guangdong Province. Regarding the smearing attack against H.H. Dorje Chang Buddha III by the public security personnel, thirteen first-class legal experts in eleven institutions of law in China, including Beijing University Law School, Qinghua University Law School, Law School of Renmin University of China, China University of Political Science and Law, the Chinese Academy of Social Sciences Law Institute, the People’s Daily, the Legal Daily, and others, held a discussion forum of law in Beijing on the case. These experts of law provided their legal opinions, stating, “As the ‘victims’ recognized by the verdict in this case, Lau Pak Hun and Liu Juan did not have money or property that was defrauded. Both ‘victims’ also denied being ‘victims’ of fraud in this case. …… There exists no fact of any crime committed and there was no criminal in this case. What is the fraud to speak of?” The experts also requested the verdict to be corrected. According to information revealed, the unlawful public security personnel in Guangdong and Shenzhen led by Chen Shaoji privately embezzled lots of money, properties, and valuables using the opportunities of handling cases. They stole more than 700 paintings and calligraphies created by H.H. Dorje Chang Buddha III’s painstaking efforts through several decades (if calculated by the current auction prices of H.H. Dorje Chang Buddha III’s paintings and calligraphies, these paintings and calligraphies embezzled into private hands are valued at more than 40 billion CNYs or 6.5 billion US$ by a conservative estimate) but also robbed tens of kilograms of gold and jewelries as well as famous watches and other valuables from the jewelry company owned jointly by Liu Juan and Wu Wentou. In addition, the over 70 famous ancient paintings that Wu Wentou had bought and collected for his planned jewelry and antique store were also illegally taken away. No wonder such big tigers will not refrain from eating humans! Although the corrupting officials led by Zhou Yongkang and Chen Shaoji in persecuting H.H. Dorje Chang Buddha III later were sentenced to jail one after another due to their corrupting and degenerating deeds found in other cases, the embezzling and corrupting members of the police involved in this case are still within the rank of public security personnel of Guangdong Province. To cover up their crimes of embezzlement, they resist the cancelation of the arrest warrant by all means. Worrying about their embezzling acts being exposed, they spread rumors everywhere to describe H.H. Dorje Chang Buddha IIIas a bad person, to delude the great masses and cover up their own embezzlement and corruption. The Economist once reported that, during the time when Hu Jingtao was the general secretary of the Chinese Communist Party, Zhou Yongkang who was in charge of the Politics and Law Committee and the Ministry of National Security was almost as influential and powerful as Mr. Hu. With Niu Ping plus Zhou Yongkang who was called the “big tiger,” these accusers forging accusations had extremely strong political power. Therefore, it is not difficult to understand that the arrest warrant published on the internet could stay there for years because no one dared remove it. Although INTERPOL did issue an arrest warrant of Red Notice near the end of 2004 based on the application submitted by China, but there were only two “victims,” Liu Juan and Lau Pak Hun, mentioned in the entire process of legal proceedings as well as media reports, both of whom stated publicly and in multiple times that they were not victimized. They even emphasized the kindness and virtue of H.H. Dorje Chang Buddha III. Experts of law in China exonerated H.H. Dorje Chang Buddha III. Both victims in the case denied being defrauded. There had never been any change of ownership to the funds or properties they owned. The so-called money or property being defrauded was just investments made by these two persons. 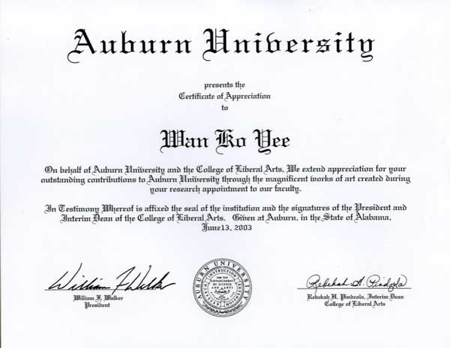 Additionally, “Wan Ko Yee” was not even a recipient or partner of the investments. Whatever fraud mentioned in the case was simply nonexistent. In June 2008, China proactively asked INTERPOL to cancel the arrest warrant which was officially canceled by INTERPOL in October 2008. These facts all belong to the information publicly accessible to the general public from the internet. 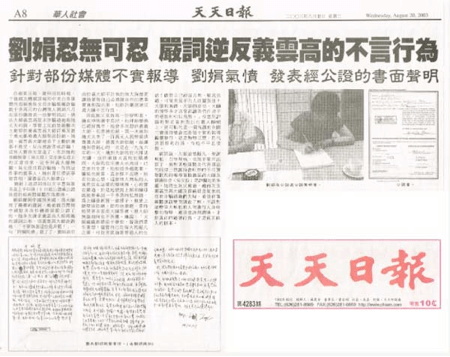 During the course of this persecution, a local newspaper in Sichuan Province of China called Huaxi Metropolitan Newspaper fabricated a piece of society news with forged information. Due to republications by news media, this article is often used as a slandering topic. It belittled H.H. Dorje Chang Buddha III who has doctoral degrees as having the education of the fifth grade in elementary school and described Him as a temporary worker of painting. The fact is that H.H. Dorje Chang Buddha III received the title of “Fellow” from the Royal Academy of Arts of Great Britain, which was awarded only once in the history of this world-class institution of arts for over 200 years. His Holiness the Buddha also received the titles of honorary doctoral degree and professorship from 92 universities in the USA and other countries. This status is the highest honor among people of Chinese origin in the world. From 2000 to 2009, H.H. Dorje Chang Buddha III was a professor at Auburn University in the USA and frequently received awards and commendations for His outstanding performance. Could a person with the education of the fifth grade in elementary school be a university professor? More notably, the paintings by H.H. Dorje Chang Buddha IIIfrequently set new price records. In 2015, His painting entitled Loquat created an astonishing price of 1.7 million US$ per square feet at the New York Fall Auction. His accomplishments in 30 big categories broke the highest record in history of accomplishment by a person. In the fields of morality, philosophy, poetry, painting, calligraphy, music, medicine, and so many others, He is expertly proficient in all and has made highest accomplishments. In contrast to the international reputations for His comprehensive accomplishments in so many domains, what was in the slandering article is simply ridiculous. This false case of fraud deceived some living beings for a time, but cannot contaminate His Holiness the Buddha. Rather, it can only further manifest H.H. Dorje Chang Buddha III’s unsurpassed morality, sentiment, and conduct with selflessness, fearlessness, great love, great compassion, and doing everything to benefit living beings! Now, many people in society who have ulterior motives and lack morality are using my name to attack and slander H.H. Dorje Chang Buddha III, my Buddha Master. I feel very furious and sad! Actually, you do not know the real situation at all and only saw the superficies. As a matter of fact, during the entire period of more than ten years since I became a disciple of my Buddha Master, every time I met with my Buddha Master, He was always so compassionate, so kind, and so caring about everything of us who are disciples! He is never concerned with the deformation against Him from others and just bears living beings’ sins! For quite a few times when I was paying homage to my Buddha Master, I mentioned that I wanted to write a statement of clarification to testify that my Buddha Master never defrauded me. However, He always declined. Now I saw more and more immoral persons using my name to slander my Buddha Master. I cannot stand this anymore. I want to state the fact to clarify. The great H.H. Dorje Chang Buddha III has always been my most revered master! He never defrauded me! I hereby give this statement to clarify! My Master H.H. Dorje Chang Buddha III never defrauded me! The person who defrauded me for more than 60 million Hong Kong dollars is my inferior fellow Buddhist sister Wong Hiu Shui. For that, the court in Hong Kong sentenced her to nine years’ imprisonment. She has received the punishment by law that she deserved. I always think that my Master H.H. Dorje Chang Buddha III is the greatest and the most selfless. The case of fraud involving the star Buddhist hall “Wisdom & Mercy” was sentenced yesterday. Wong Hiu Hui, the former chairperson of the Wisdom & Mercy V. D. A. Limited, and her brother Wong Fai Tung received severe sentences of imprisonment for 11 years and 7.5 years respectively. Separately, they were also deprived of the right to serve as a director of a company for 15 years. The attorneys of both of them thought the sentences were extremely severe punishment. The judge pointed out that the crime committed by the two defendants in this case caused a loan of 97 million HK$ from the Xin Hua Bank to become a bad loan. Wong Hiu Hui (44) and Wong Fai Tung (34, former director and general manager of Jinke Digital Intl. Holding Co.) forged a resolution of the board meeting of Wisdom & Mercy to mortgage the property of “Master’s Museum” located at No. 22, Kent Road, Kowloon Tong and valued at 56 million HK$ to the Xin Hua Bank, to obtain credit and loan services for the two companies owned by Wong Fai Tung. The judge pointed out that the two sister-brother defendants have started their premeditated plot for the property long ago. Within the two years after the real estate at Kent Road was purchased by a “tycoon follower” of the Buddha hall Lau Pak Hun in 1995, the defendants already submitted the property to the bank for appraisal and planned on applying for a mortgage with it. Although the plan was put off later, in 1999 they again mortgaged the property to the bank for a credit line of 40 million HK$ for the two companies owned by Wong Fai Tung. Shortly after that, 20 million HK$ was withdrawn from that credit line. Even until now, the two companies still owed the Xin Hua Bank 35 million HK$ and 58 million HK$ respectively. [ii] Resolution No. 614 of the Senate of the 112th United States Congress, which was passed unanimously to crown H.H. Dorje Chang Buddha III with the title of H.H. (His Holiness) to respectfully address Him. [iii] The document of final verdict sentencing Wong Hiu Shui and her brother by the Hong Kong Court. [v] A rinpoche and a dharma master were jailed for many years due to injustice. Their testimonies exposed that the public security personnel used ways of spy wars to torture and interrogate. Yesterday, someone told me that some people thought that, since she had contributed a lot of funds to support and build temples, install Buddha statues, and visit famous mountains to pay homage to the Buddha, what she did is establishing great merit. Actually this is not correct. It could be merit, but could also be sin or negative karma. The reason is that you have to look at whether the temple is practicing the genuinely true dharma of the Tathagatas or not and whether the abbot of the temple is an ordinary person or a holy virtuous one at a certain level. If the abbot is a holy virtuous one, you will have merit to speak of. If, on the contrary, the temple’s abbot is an amateur to Buddhism or a master of evil teachings, the temple will transmit false Buddha-dharma and practice evil views from generation to generation and may even engage in forecasting based on word analysis, fortune telling, and spreading superstitious belief to heretics, strange or paranormal phenomena, evil deities, or spiritual manifestations. Such a temple will become a site of defrauding living beings and generating sin and negative karma, and people who make offerings to build this type of temples will definitely be sinful and malicious accomplices. We understand that people who intend to do Buddhist work absolutely want to know making offerings to which temple and doing what Buddhist work are creating truly permanent merit, but we can only say “that is unclear.” The reason is that you must see whether what the temple advocates and spread belongs to the true dharma of the Tathagatas or not and whether the temple’s abbot is a holy eminent monastic or not. If the abbot is not a holy eminent monastic and is an amateur to Buddhism, there exists no cause of planting merit and there is no way to know whether the successor of the next generation will be evil or upright. Great holy virtuous ones said, “Exactly because we do not know about the temples you made donations to, we dare not make conclusive statements in response to your inquiries regarding upright or evil and good or bad. In short, if the temple does not have a holy one as the abbot, there is no way to know what it will be in the future as a result of incidents and changes as history evolves.” The real situation is exactly as the great holy virtuous ones said. For example, Beijing has a very huge temple called the Tanzhe Temple. After the changes occurred through history, not only the temple has no eminent monastic now, there is not even a monastic stationed at the temple. The temple only has non-monastic staff personnel maintaining the cultural relics there. You all can think and recall the fact. How could be such situation existing only in the Tanzhe Temple? There are so many declined temples, closed temples, and temples used by heretics to deceive people. The number is in many thousands and is not what anyone can count. There is a Ms. “Dongfang” who has no knowledge about Buddhism. She baselessly wrote slandering words without learning about the locality and situation of the Ancient Buddha Temple. 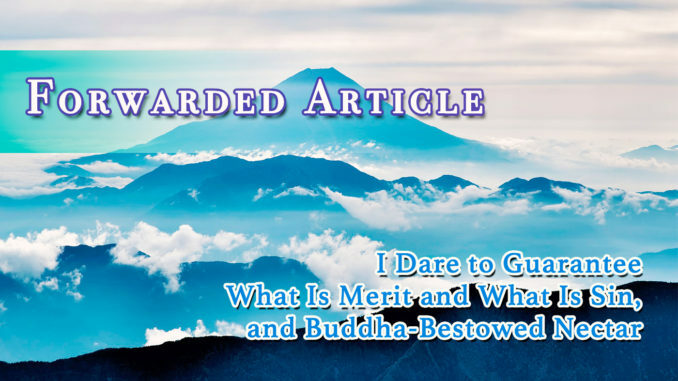 She even directly slandered the fundamental teachings and Buddha-dharma of Sakyamuni Buddha and slandered the Three Jewels of Buddha, Dharma, and Sangha. She wanted to deny the law of cause and effect and slandered the Buddha. Doing so is truly an act of sin and dark karma! Related to her slandering, today I looked at the related documents and materials at the World Buddhism Association Headquarters (WBAH), including the schematic drawing from the geological report and the planning diagram. There is not any false word from what WBAH said. The Holy Heavenly Lake truly exists. Under the ground there is truly a big lake of crystal deposit. It is true that a big underground river flows through under the ground of the Holy Heavenly Lake. It is true that the local council passed a legislation to approve the land at the Holy Heavenly Lake as a religious site. It is true that the World Buddhism Association Headquarters decided to build the main Buddha hall of the temple as the tallest Buddhist grand hall in the world. Moreover, the diagrams of the Buddhist Center (the Buddhist City) and the Ancient Buddha Temple have already been drawn. One, we will wash the bowl clean and then put the cover on the bowl. That “Dongfang” can put the bowl at any place to play the “scheme plus magic,” but we will guard and watch the bowl. If she can apply the “scheme plus magic” to cause nectar which is not in the form of any substance in the world to descend into the bowl, I will lead the crowd to respect her as our master. Two, conversely, for the sake of having the presence of “Dongfang” to prove the dharma and thus save Buddhists, we will let “Dongfang” wash the bowl clean. She can then place the bowl anywhere as she wishes and guard and watch the bowl herself. The tremendously great holy virtuous one will, from a distance of several dozen meters to bestow nectar from the space to the bowl placed before and guarded and watched by her! If Buddhas do not bestow nectar, I, Chen Yigu, will cut off my right arm by myself and burn it as an offering to Buddhas, as the warning and punishment to me! This is because I irresponsibly speak nonsense and should meet malicious retribution! On the other hand, once nectar is bestowed, my condition is that “Dongfang” must write to the public to repent her sin of slandering Buddha, dharma, sangha, and nectar and, from then on, correct the evil and pursue kindness, benefit mankind, learn and practice true Buddha-dharma, and be a good person!!! Why do I dare to guarantee so adamantly and definitively? This is because I followed H.H. Dorje Chang Buddha III for 23 years. I know so well that H.H. Dorje Chang Buddha III is a true Buddha! I saw Buddha-bestowed nectar with my own eyes. I saw that Buddhas arrived in the sky and then bestowed nectar into the dharma bowl so vividly. 20 years ago, when I spoke to Great Geshe Luosang Zhenzhu, he said that great holy virtuous ones could not even compare to a finger of H.H. Dorje Chang Buddha III. He mentioned that the difference between Buddha-dharma in Tibet and Buddha-dharma held by H.H. Dorje Chang Buddha III was as big as the separation between the ground and the sky. Who could invite Green Tara to manifest for me to see? Only H.H. Dorje Chang Buddha III did that. Dharma kings in Tibet were unable to! I, Chen Yigu, saw in person that the 32 major marks of a Buddha appeared from H.H. Dorje Chang Buddha III. That was when I and several other people went to pay respect to the tremendously great holy virtuous one. His servant led us into a room on the 18th floor with only one door to wait inside. Once we got in, all we saw was the empty room and the blue sky and white clouds outside the window. Suddenly, the tremendously great holy virtuous one appeared in the sky outside the window and penetrated the glass to enter the room, but the glass was still perfect without any damage. At this time, a solemn and majestic mandala emerged inside the room and manifested itself! After being scared into screaming, all we had was the excitement and joy while our faces were covered by tears! As a person who experienced true Buddha-dharma, why don’t I dare to make such a guarantee?!! !